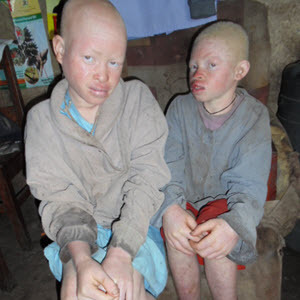 The goals and initiatives to be pursued by Humanity Healing International in Uganda for the Albino Program consist of Rescue of At-Risk Children, Awareness Campaigns, Educational Outreaches and Advocacy. Give a Child a Future! Sponsorship of a Rescued Child is only $30/month! Redesign conventions and eliminate false beliefs of the non-humanity of albinos. Fight discrimination and segregation/social isolation. Progressively eliminate barriers for further social and work inclusion. Social and cultural awareness are the key factors to eliminate barbaric and archaic practices, such as murdering, mutilation, abuse, and discrimination. It is important to reinforce, especially to the extended family of the albinos, that they are also human beings. Provide educational and vocational support to albino children and young adults. Involve the vulnerable albino child or young adult in the decision-making process about their future. To provide a support system for local, vulnerable populations of albinos. Counseling and support for families. Evaluation of risks, situational danger, and determine an inclusive, humanitarian intervention. Mobilization of public opinion, through awareness campaigns, to ensure the safety of these vulnerable individuals, and guarantee the observance and effectiveness of their universal human rights.